Michael Hodgson has forged a relentless path in the music world since his early days as Tinnitus, a music & performance art project with Angus McNaughton and Ashley Turner in Christchurch in the mid 80’s, and then as The Projector Mix, an industrial dub project in Auckland in the early 90s. The latter led to him meeting Paddy Free and forming Pitch Black in 1996, since when they have released 5 albums and toured the world numerous times. Not personally interested in making popular music or following trends, Michael is happiest on the edges, subverting conventional musical structures and echo systems. Misled Convoy has become the vehicle for exploration outside of the constraints of his more populist collaboration. 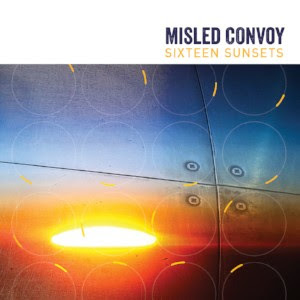 The first Misled Convoy release was a live album recorded at Beautiful Music, Auckland in 1999 and was followed by remixes of a plethora of acts from around the world, including NZ's own The Adults, London pop punks Feral Five and ambient dub pioneer Banco de Gaia. Living on opposite sides of the planet since 2012, Pitch Black's last hiatus gave Hodgson the chance to finally record Misled Convoy's studio debut, 'Tickling the Dragon's Tail' in 2014. Hailed as "stunning" by Louder than War, it was expectedly dark and dubby, but was also surprisingly groovy in parts with plenty of ambience and noise in there too. The bonus track alone was over an hour long and sounded like a microphone melting in a fire. Now Misled Convoy is back with the sublime new album 'Sixteen Sunsets', alive with sonic ideas and influenced by the multitude of sounds he's gathered as he travels the world. Found-sounds recorded in Iceland, Sweden, Turkey, Italy, Croatia, Spain, Greece, England and Austria have been woven together into delicate yet sophisticated pastiches, layered and twisted with beats and melody, leaving the listener to sense the world around. The cicadas of a Greek island, the automated voice of a Stockholm bus, the sounds of rubber on cobblestones at a Roman roundabout, the unusual chug of a narrowboat on a London canal – all are drenched in effects and underpinned with Hodgson’s signature dub and bass. Five out of the nine tracks feature the emotional harmonies and melodies of young songwriter Ines Dunn. As an established music producer wanting to support and encourage women in the industry, Hodgson has spent time with Ines to show her a different approach to music making. His investment has been repaid in spades, as Dunn’s simple touches on the album have added powerful melodic punches in all the right places. Nowhere is this more evident than in the opening track "Blind Light", with samples referencing the last Misled Convoy album 'Tickling the Dragon’s Tail'. Dunn tickles the keyboard while Hodgson weaves the industrial sounds of a plastic bottle making machine. The beats and layers grow over the three following tracks until we come to the fifth track, "I am Full of a Thousand Holes", one of the standouts on the new album. In the hands of most modern dance producers, the monstrous bass riff that underpins the track would be rinsed and repeated, ad nauseam, with all the subtlety of a sledgehammer. In Hodgson's hands, it slips and slides through the melody, ducking and weaving around the beat, and then, just as the tune reaches its peaks, he drops everything and reduces the track to trails of sound. A dancefloor killer in every sense! Trails of sound are how Hodgson’s music making often begins. After finding a Russian language vowel sounds 7” box set in a charity store, Hodgson researched which nations had sent astronauts to the International Space Station (ISS). The 7'' became the vocal bed for the title track "Sixteen Sunsets", which was then augmented with vowel sounds from the other nations who have also inhabited the ISS. The title is inspired by the phenomenon that, every day, due to orbiting the Earth every 90 minutes, the residents of the ISS witness 16 sunrises and 16 sunsets. To complete the concept visually, Hodgson has worked with artist Hamish Macaulay, who also designed his previous two albums. Recommended listening requirements: eye patch, cushion, surround sound and big bass. Hypnotic trance-pop group My Baby, will be hitting our shores for a nationwide tour between Dec-March. This will be their fourth return after their Prehistoric Rhythm album pre-release tour in 2017. Misled Convoy has become the vehicle for exploration outside of the constraints of his more populist collaboration. RÜFÜS DU SOL, one of the world’s leading live electronic bands, have announced a one-off show at Auckland’s Logan Campbell Centre on Friday March 8. Global award-winning electronic act The Prodigy are set to play one New Zealand show in 2019 to celebrate the release of their new album ‘No Tourists’ to be released globally on 2 November 2018. New Zealand's First Lady of Drum n Bass Tali today releases the video for Eye On You, taken from the release of her first DnB album in over seven years, ‘Love & Migration’ – out on October 26th. German electronic music pioneer & DJ extraordinaire Move D, alongside Chicago DJ of the Motherbeat, Eris Drew, have announced a two room rave extravaganza at Whammy Bar on November 23rd. Jayda G & Melbourne heavy-hitter Roza Terenzi are heading to New Zealand for shows in Auckland & Wellington this November. Chase & Status and MC Rage have been added to the Northern Bass lineup. The second lineup announcement for Northern Bass 18/19 is here. New Zealand’s premiere house and techno-focused festival, Sonorous, is back! Returning for its second year, the one-day extravaganza will be held on the Sunday of Auckland Anniversary Weekend, January 27, at Matakana Country Park, just outside of Auckland. GRAMMY award-winning DJ and producer David Guetta announces the date and tracklisting for his long awaited new seventh studio album titled ‘7’ –which arrives officially on 14th September. Faithless are a phenomenon, and a cornerstone of the electronic music scene. For over twenty years, they have given the world some of its most euphoric moments, soundtracking the high points of a whole movement. Fresh from a sell out night at Wembley Arena, legendary UK Grime event Eskimo Dance brings the authentic sound of London to New Zealand in a touring first - showcasing an MC line up that features some of the biggest names in the scene today. With his hotly anticipated album NOVA released, RL Grime now announces he will be returning to New Zealand & Australia this November. Bringing along GoldLink as a very special guest, the tour will head to New Zealand on November 7 at Auckland’s Logan Campbell Centre. Detroit heavyweight Theo Parrish will celebrate 20 years of his influential Sound Signature label at Galatos on the 30th September. In a time of growing uncertainty, where strange forces work to build walls between us, Wellington's electronic dance pop extraordinaire, Jon Lemmon, makes music to bring us back together. Brutal and beautiful; honest and dreamy, ‘The Power’ is about being loved by someone. “A love so big, that it makes you feel strong and powerful - like you have a secret weapon, and like you might actually be able to survive it all,” explains Helen Corry. Good news for those who missed out on tickets to Synthony at the Town Hall in Auckland on September 15! A second show - presented by Spark - has just been announced. Madly have released their etherial electronic second track, ‘Honey’, a luxurious and layered piece of work that weaves its way into the subconscious with velvety vocals and an infectious beat. Dynamic duo, Lee Mvtthews, have just released the video for their new dance floor banger, ‘Inside Out’, featuring Watson. Due to popular demand, Synthony is returning to the Auckland Town Hall. For one night only, on Saturday, September 15, the iconic central city venue will transform into a dance party like no other! Kady Rain doesn’t just stand out with her vibrant look and unicorn colours. Following the release of their world-dominating single ‘These Days’ feat. Jess Glynne, Macklemore and Dan Caplen in February, BRIT-Award winning collective, Rudimental have announced the release date of their eagerly awaited third album TOAST TO OUR DIFFERENCES. Nina Las Vegas calls him "one of the hardest working DJ’s going around". Nest HQ describe his sound as "swimming somewhere around the sounds of folks like Major Lazer and DJ Snake". Spenda C remains as one of the most in demand bass artists in the country. Bab Stiltz is set to release the Showtime EP on June 8. The First Lady of Detroit - K-HAND - is heading to New Zealand for the first time performing at Auckland’s Galatos on Friday June 1st.